Exercise and healthy eating have been known to boost your mood, happiness, self-esteem, confidence and have countless other benefits. And those benefits in turn can bring benefits to your relationship (improved romance and intimacy are just two examples), which is why these two relatively different blogs have come together for this post! Together, we’ve come up with the “12 Days of Fitness", a series of 12 minute healthy dates for 12 days with a fun downloadable chart for you to track your progress. So, do you have 12 minutes a day to improve your relationship? 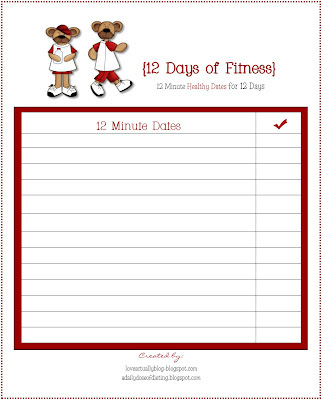 We’ve also included a blank chart so you can fill in your own 12 minute healthy dates. ...and for more help with your healthy New Year’s resolutions, stop by A Daily Dose of Dieting! some of those things on the chart sound really fun! if my hubby weren't still unable to walk, we would be doing them all! Cute ideas. Thanks. We are always looking for ways to be healthier. Happy New Year Cher! I am very happy to see your blog and it is of interest for the people who are likely making regular time table. Thanks for scheduled post. This is such a fun idea. I dont' know how I missed this post the first time around. Either way, my husband is more or less a health nut and I'm sure he'd love this! the lemonade stand blog award. hop over for details. New Diet Taps into Pioneering Concept to Help Dieters Get Rid Of 12-23 Pounds in Only 21 Days!